Microsoft Excel is a popular spreadsheet program for storing, organizing and managing data. XLS and XLSX are two file types of Microsoft Excel spreadsheets, currently are widely used for home and office data collections. While working with an excel file, problems do sometimes occurs. Then what if you accidentally delete an important excel document without backup? Don’t be panic. When deleting an excel file, you are not actually losing it. Most of the time, the file is still there and can be recovered with proper excel recovery software in just a matter of seconds. Excel File Recovery is a program that was developed to recover Excel file form computer or removable devices securely. It supports recovery of Microsoft Excel file in .xls and .xlsx formats made by various versions of Excel, including Excel 2010, 2007, 2003, 2002, 2000, 97, etc. Note: Excel File Recovery for Mac is also available. Please select the right version according to your computer system for excel recovery. 1. 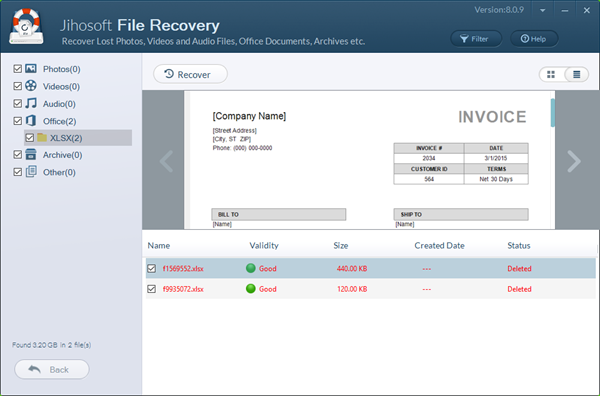 Start XLS/XLSX File Recovery and choose the partition where you need to recover excel spreadsheet. 2. Choose the “Normal” scan mode and then click “Scan” button to search for deleted excel documents. 3. Preview the found files after scanning. Once you’ve chosen the excel files, click “Recover” to undelete excel files. - Once your excel files are deleted, please don’t putting any new data to the partition where you lost the excel files. - Don’t download and install the excel file recovery program to the disk that you lost your excel files from. - Don’t save the recovered excel files on the original place again. Find another partition or external device to store them. - Files are easily lost due to various reasons. It is always a good idea to make a backup of your important excel documents.